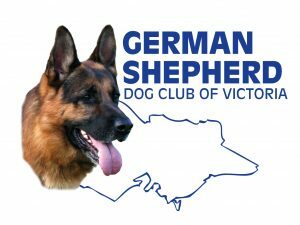 Obedience is taught to the majority of members joining the German Shepherd Dog Club of Victoria as most join the club to socialise and train their dogs to be good companions and family pets to them and good canine citizens in their own local community. It is pleasing to take a well behaved dog out walking in the local streets and parks, whereas if the dog is not well behaved it is not enjoyable for the owner and is not good for our “breed”. We start training puppies at eight weeks of age and they stay in puppy class until they are six months of age. During this time they attend the branch of their choice and their handlers are taught to handle the puppies in lifestyle training, obedience, socialisation and they can take part in conformation classes to learn about showing. They then progress through classes 1 to 4 when they will be ready to take part in the trialling class and ringcraft ready to start trialling should they wish to. The idea of Obedience Trials is to demonstrate the usefulness of the dog as a companion and guardian of man and not the ability of the dog to acquire facility in the performance of mere tricks. The classification which has been adopted is progressive with the thought in mind that a dog which has been granted the title of OBEDIENCE CHAMPION has demonstrated its fitness for a place in our modern scheme of living. What’s involved in Training – for Instructors and Members? In order to train members to the standard required to pass up from each class we have club instructors who have undergone a club training programme and have completed a theory exam where they must gain a pass rate of 95% and complete a practical test. When their chief instructor thinks they are at the standard required to pass that test (and if they pass!) they become qualified club instructors of the GSDCV. It is the responsibility of the Obedience Training Committee to see these standards are met. We have a club training manual which the Obedience Training Committee is responsible for producing and updating from time to time when necessary. This manual has exercises listed for each class and even though it is a guide to how instructors train the members in their class, it provides uniformity of training at each branch. At Fundays this is clearly evident when Class 1 members from all branches compete against each other, as does class 2, 3, 4 and trialling classes. The scoring shows clearly that each class is at a similar standard, some members and their dogs being better than others depending on how long they have been in that class. Naturally someone who has been in a certain class for ten or so weeks should be better than someone who has just been passed up to that class. There are stipulated time frames that each class should take to get to pass up stage, however it is only a guide and some reach that standard quicker than the timeframe and others take much longer. As our instructors teach adults to train their dogs, instructors have to make sure the handlers understand what is required of them and then we have to make sure they are carrying out those exercises correctly. Our training includes motivational positive training and instructors are encouraged to make their classes fun for both the handlers and the dogs. Classes break for play sessions for handlers/dogs throughout the hour they train and handlers are encouraged to build up a good rapport with their dogs. Lifestyle training is undertaken at most branches – exercises include getting your dog in and out of a vehicle correctly, going through a gate correctly with handler, walking over different surfaces, how to behave when a person riding a bicycle passes, working with distractions, going on walks and meeting and greeting people and other breeds of dogs from the local communities, teaching dogs how to behave when someone knocks on the door and many other things that dogs will come into contact with during their daily routines. Instructors are encouraged to attend seminars, lectures and conferences on dog training or dog related topics to further their knowledge, thereby providing better instruction for their class members at their respective branches whilst retaining the principles of our training methods in our training manual. Most branches have purchased expandable tunnels which are set up in a square to a pattern and the dogs have great fun negotiating the course and going through the tunnels with their handlers having to keep up with them and directing them through the tunnels in the order they have been set up. Dogs and handlers do this with great gusto. If you have a German Shepherd and would like to join our club then check out our list of training branches to find one in your area. If you are planning to get a puppy then visit puppy listings for details of puppies available from breeders who are members of our club and who comply with all requirements of them in order that puppies they breed can be listed and recommended for sale by the club. By following these requirements we believe we as a club are presenting to the public a better quality puppy for purchase. When you attend the training branch of your choice be assured of a warm welcome and we hope a long time commitment as a member of our Club.